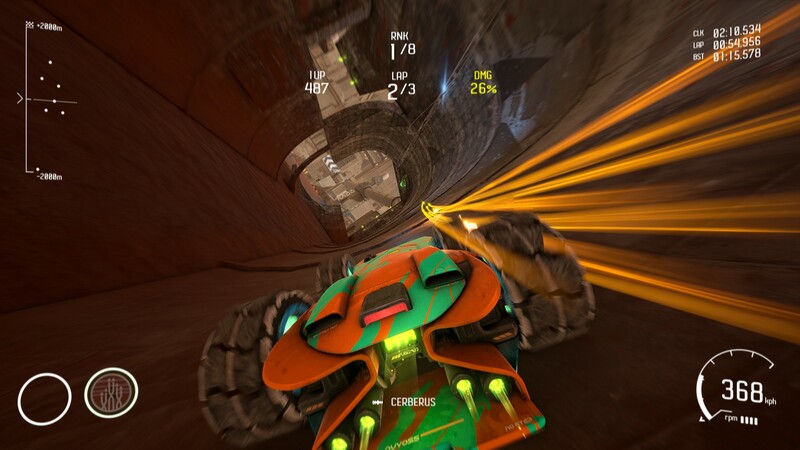 Did you guys ever play Rollcage? It's an action racing game that came out in 1999 for Windows and Playstation. 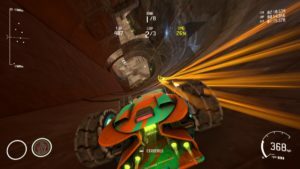 Players took on the role of extreme race drivers who piloted purpose built vehicles that could operate at extraordinary speeds, driving on walls and ceilings because of the powerful downforce they generated. They could even tumble over and remain driveable because of their oversized wheels. Not to mention there are weapons involved to make things interesting. 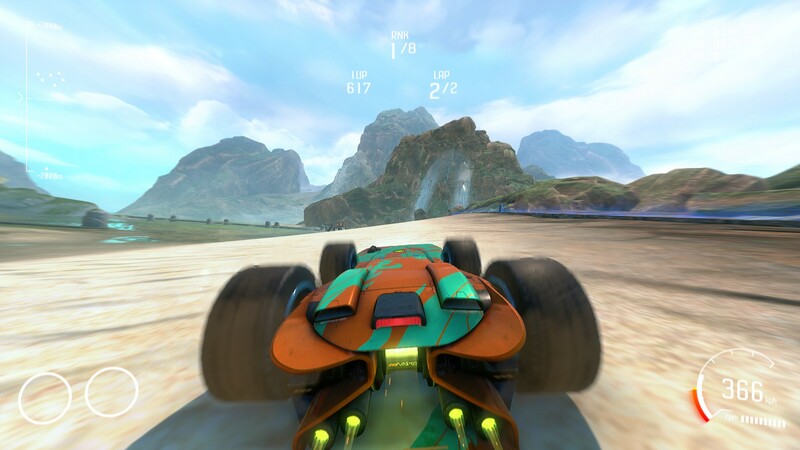 Think about something along the lines of Mario Kart, but at closer to the speed of sound while almost every surface on a track could be utilized. And instead of shells and bananas, there are homing missiles and mines. I know! Sounds great right? I loved it. I had a copy for PC back in the day and I couldn't tell you now what happened to it. I played it a ton and then, like everyone else, I eventually moved on to other things. Years went by and I'd go a long time without thinking about it, but occasionally Rollcage would pop back into my head and I'd think, "...Man someone should re-make that". Well as it turns out back in 2016, GRIP took hold of Steam's Early Access program and honestly I only vaguely remember hearing a little bit about it before it disappeared from my mind. Early access, after all, is pretty hit or [mostly] miss. But on November 6th, the year of our lord 2018, GRIP went gold. The ultimate racing gods smiled upon us mere mortals as we are now, once again, able to tempt fate while navigating twisting tracks at speeds of fighter jets while shooting missiles at each other, thus wearing our controller buttons to naught but overused nubs. So the first thing you need to know is that Grip has no chill. You'll average speeds of around 400kph, or around 250mph, and I've hit speeds of 950kph, or around 590mph. There's even an achievement for hitting mach 1... I haven't quite done that yet but I've only been playing like, twelve hours now. But let's talk about getting started before we go much further on, shall we? Players will begin in a tutorial that will teach you what you need to know. 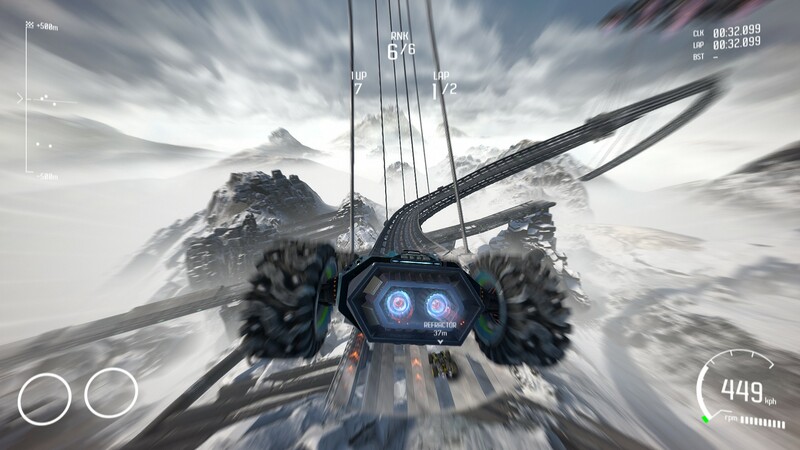 Drive forward, drive on the ceiling, drive on the walls, shoot at other racers, now you know how to play GRIP. So, the learning curve isn't steep but it does climb a bit to be able to master game play. 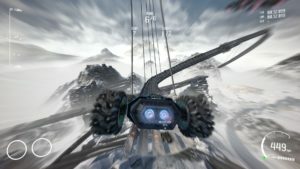 Grip is for PC as well as PS4 and Xbox One. My copy is of course on PC because that's still my chosen platform for gaming. That said, I do recommend playing with a controller. You're going to want that analogue stick for turns instead of instant digital steering. Though you can adjust that in settings. You'll start with two vehicles all ready to go. There are fourteen cars in total and they vary in design and stats. Some may have a higher top speed, or handle better etc. It's important to note though that those statistics are there more to individualize each car rather than to make one be better than another. Once you're on the track they feel largely similar. Just having a vehicle with better acceleration or strength isn't going to guarantee you're faster or stronger. That comes down to how you play, with the vehicle you've chosen just helping your skill set along. 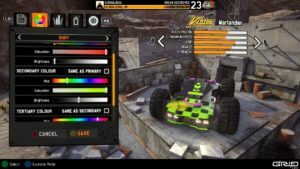 The best thing is that you can unlock all of the cars for use just by playing and gaining experience. The race tracks you'll be driving on are large, unforgiving and atypical is an understatement. Each turn, wall, ramp or tunnel provides a surface to navigate and signs point the way to make sure you're pointed in the proper direction. 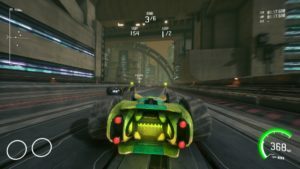 Multiple routes can be taken during races to try and take advantage of the extra speed you picked up when you hit that boost pad. Or maybe try to outpace the rest of the field by taking a more risky turn or two. They range from inner city roads with towering structures all around passing by in a blur. To snowy mountain passes where tunnels of rocks and ice bring you inches from one another. Beaches with derelict ships and even whole tracks suspended by automated drones high in the clouds. Challenges are everywhere and some of the terrain will even try and hit back. As you move through some areas your vehicle may be targeted by security in the region and you might find yourself trying to outrun or dodge missiles and gun fire. Grip shows Twenty three tracks in all, but the number is a little less as some of those are just reversed versions of tracks you may have already raced on. Which is a little weird because there's an option for "mirrored tracks" in the race settings. Either way you look at it though the game gives you lots of options to choose from. Pick-ups are essential to each game mode and they range from a simple speed boosting "Firestorm", to machine guns and rockets, to a disruptor that will cause loss of control for any vehicles around you once it's used. Two are attainable at one time and show up in the bottom left corner of the HUD. The right and left bumpers on the controller will use the corresponding item. It's a pretty simple system. Items can also be charged by holding the button down. Doing so will consume one of the items and double the effect of the other. So one Scorpion Missile will become two, the Hydra rockets may target more than one vehicle, the Shield will protect the front of the car as well as the rear and so on. Vehicle position is important when you're trying to target another racer. A targeting HUD will show a indicator and that will change colors when there's a lock, helping to ensure a more successful attack. There's a standard menu with typical video and audio options to go through. From there you can also set your control sensitivities and remap keys. Where it starts to get interesting is when you notice you can adjust the speed of digital steering in an attempt to make the wheels on your vehicle react a little less quickly to digital key presses. A synthetic analogue control option, basically. Pretty cool. I still recommend a controller but it's great that there's an option for folks who may not have one. And speaking of controllers, you can choose to have buttons show on the screen as keyboard and mouse, Xbox, or PlayStation buttons. 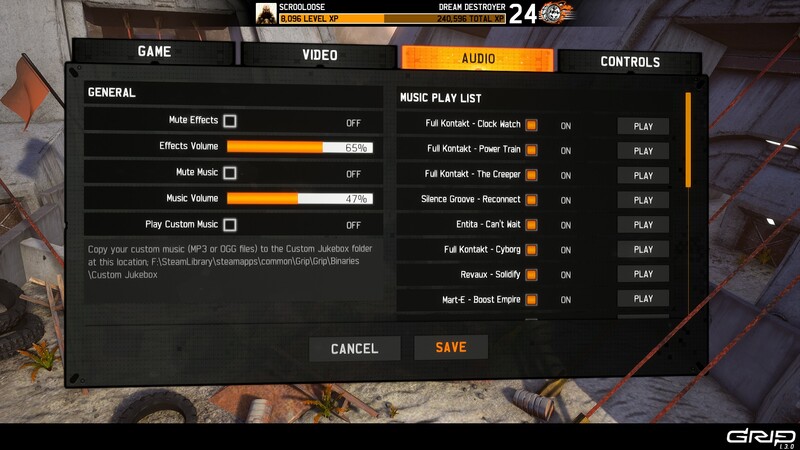 In the audio tab you can change the volume sliders as usual but there's also a mute button for sounds if you prefer to play just to a musical soundtrack. There's also one for the opposite effect. Or of course you could choose to mute both music and sound and play silently. Useful for quick office matches I'm sure. The other option is one that I love and isn't seen a whole lot these days. That's the custom jukebox option. 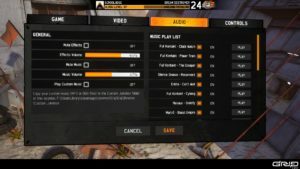 With that tab you can go into the playlist and choose which music you'd like the game to play or not by checking boxes on song titles. Which is cool by itself, but you can also drop your own Mp3's in the custom jukebox folder in your game's Steam directory and GRIP will play whatever you like in the background. The only complaint I have with that is that the custom jukebox isn't good at randomly picking music nor will it play music sequentially during races. Instead, whichever track it started with is put on repeat. You do have the option to change tracks manually, but there seems to be a weird bug in the custom jukebox that will just overlay songs on top of one another so you hear two or three at once. Hopefully that's patched out because it's cool to be able to choose a genre to race to. There's something oddly comedic about driving 320 mph to free market grocery store music. 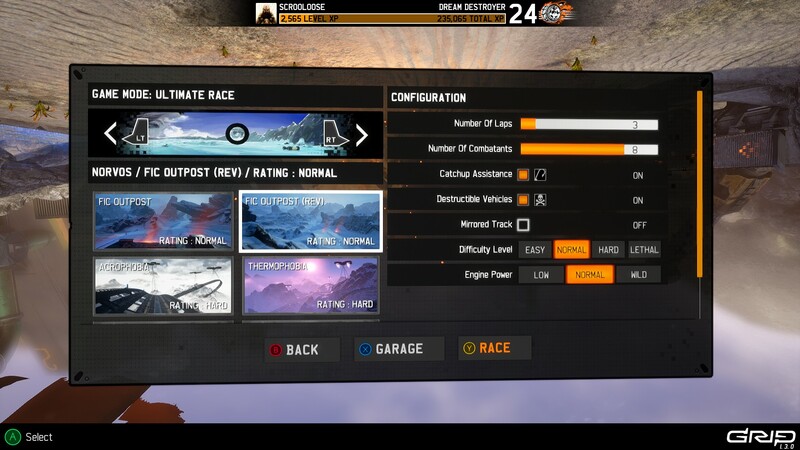 Then there are race track settings and game modes. 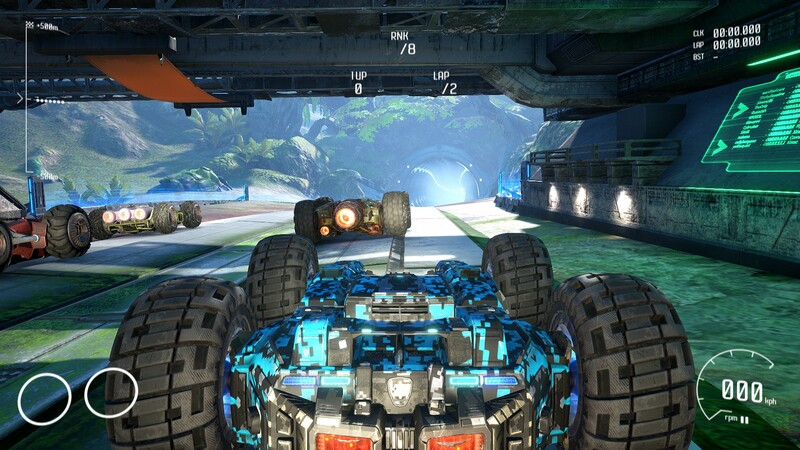 There are five, race modes to choose from, a Combat Arena mode where the option is to blast one another even more than usual and a "Carkour" mode that boils down to navigating challenges in order to pick up collectibles. You can play the campaign for ever increasing difficulties to unlock while racing small tours. 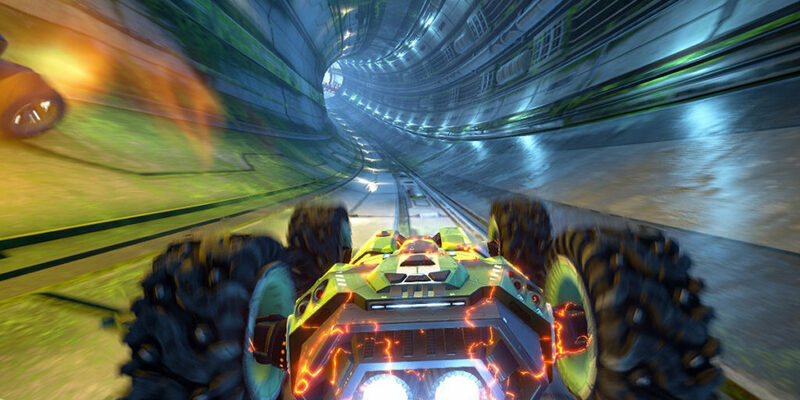 I prefer to play in single player mode and choose a race mode and tracks to roll to. Ultimate Race Mode, is my favorite because your position in the race is only part of your overall points tally. You're also rewarded for using the weapon pickups successfully. Elimination race is also fun because every thirty seconds, the last place vehicle is blown up and eliminated from the race. 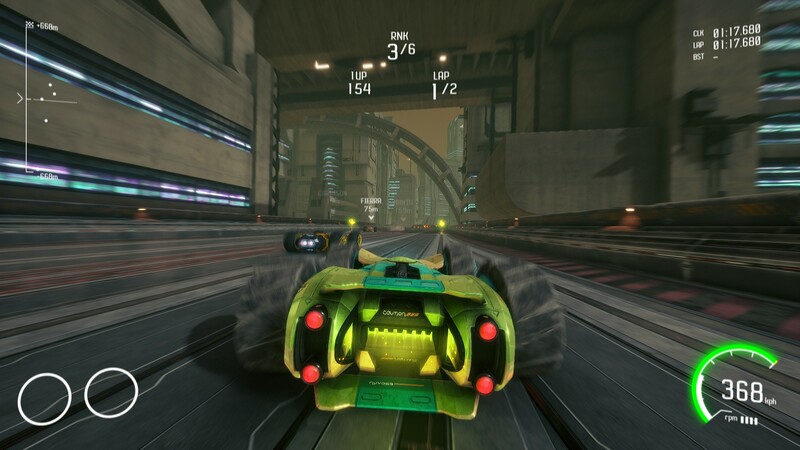 There are other modes as well, including racing with no weapons if you prefer to try your hand at skill only driving. 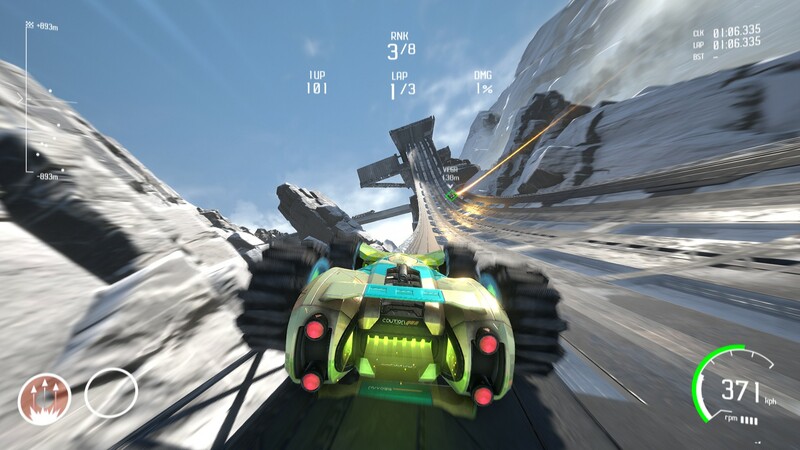 In single player it's also your choice of race tracks. Choose one and go... but that's not all. 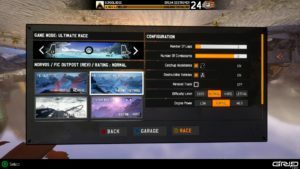 You'll also have an option to choose how many opponents to race against, how many laps are to be completed, whether cars are destructible, whether the tracks are mirrored or driven normally, how much engine power the cars have, bot racer difficulties and more. Customising settings on the cars themselves is also comprehensive. starting with three different colors for the body of the cars each with sliders for a 16 million color paint bar with separate sliders for brightness and buttons for color matching. The rims and tires also have their own color sliders with brightness and contrast. Decals can be placed, different paint schemes can be set and more of everything is unlocked as you play the game. There are even Paid DLC garage options for some more exotic choices. I don't care much for that fact as I've already bought the game and those should just be there, but they are in no way necessary to play. So if that bothers you like it does me, just don't buy them. GRIP uses Unreal Engine 4 and as such is highly optimized. I've recently built a new computer with a Ryzen 2700x and some high speed RAM ect, but I'm still using my old GPU. An R9 390x 8gb card. The game runs perfectly in all situations. Lighting is awesome and those settings up there also include options to increase or decrease things like film grain and motion blur. Bits of tracks could use some improvements. For instance there are no splashes when you hit water. Some of the buildings in the city tracks look a little too generic and blocky. It's small stuff but those are often the things that make a game look just a little more right. But it's quite pretty otherwise and particle effects are better than average so your explosions and such feel pretty good. It's easier to show you. Check out this video I cut together and keep in mind that at the time I recorded it I didn't have my new Windows key yet, so there's a water mark. Boo to that. Also it would seem that 30Mbps recording isn't quite fast enough in every situation to make the framerate as smooth looking as it actually is. But you'll get the gist. P.S. if you like the music in there, do yourself a favor and check out Scandroid's YouTube Channel. You won't be disappointed. 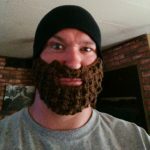 So the question is, Do I recommend GRIP? Yeah I definitely do. 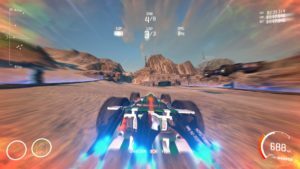 This is an extremely fast paced action racing game that happens to be a nearly perfect successor to the original Rollcage. I didn't mention sounds above at all, but they're perfect. All the cars are unique, but not so unique as to make one car "the right one to use or you're a noob", or that kind of thing. It's not perfect but it's really fun and though I haven't tried the multiplayer yet I can imagine it's a kick. It's worth the $30 price tag and I think it was released on consoles as a promo deal so should you see it in a list somewhere, check it out. It's not a very deep game but it is pretty replayable and it's my hope that the devs will release new tracks as things go on.